Our number 2 story of 2008 is also our most controversial, at least personally. The discussion around Usain Bolt generated some heated emails, but they were fan mail compared to some of the comments and emails received in response to my position on Oscar Pistorius, South Africa’s Paralympic sprint challenge, who hit the big-time in 2008 thanks to a Court of Arbitration for Sport ruling in April that cleared the way for him to run against able-bodied athletes. This post is obviously not meant as a rehash of the same arguments I’ve now been making for the last 20 months. I’d encourage anyone who has joined us recently to go back and read the articles I reference below, because without that background, this post will be thin, but it’s intended as a review, not the re-opening of a new discussion. Our coverage of the story began in July 2007, when we posted on the science and engineering that would, in theory, provide Pistorius with his advantage (for those who haven’t followed the debate, I might as well declare upfront – I believe, without a shadow of a doubt, that Pistorius has an advantage). Those advantages were discussed and explained in great detail in this post, but as yet, little evidence existed, so unusual was the case. However, the key scientific arguments were put forward for debate – reduced energy cost, improved energy return, attenuated fatigue, lower limb mass etc. One of the hallmarks of the debate early on was the refusal of “pro-Pistorius” advocates to actually debate the issues – not a single person, on this site or elsewhere, came forward to discuss the issued raised in the scientific debate. Instead, it was a campaign based on smokescreens and mirrors, one that was fuelled by the emotions and sympathy that Pistorius as a human-interest story engenders. Not a single scientific debate occurred early on – it was denial of fact and scientific opinion, and then agressive punting of a pro-human interest story. The bandwagon soon picked up speed, with PR companies, marketing agents, and big corporates throwing their weight behind Pistorius’ efforts to compete in IAAF meetings against able-bodied athletes. Nike and Ossur, the two companies with the most to gain, were aggressive in their lobbying efforts. They’d be joined by a dozen more by the end of 2008, a sign of the massive media and public interest that provided the jet-fuel for Pistorius’ campaign. In July 2007, Pistorius made his debut in European races, but on the condition that he’d be filmed and analysed as part of the IAAF’s efforts to establish whether or not an advantage existed. At this stage, it’s pertinent to ask why the IAAF should be the ones to prove advantage, as opposed to the other way around, where Pistorius would have to prove the absence of an advantage. In any event, the IAAF evidence was intriguing, because his debut race in Rome threw up a finding that was EXACTLY as predicted by the theoretical models before it. That is, Pistorius showed a never-seen-before pacing strategy, the absence of fatigue during the second half of the race, and a vindication of many of the arguments put forward earlier. The post we did analysing this can be found here. Once that was completed, the IAAF did their testing in Germany, under the supervision of Prof Bruggemann. That research, which would form the basis for the IAAF’s initial decision, found a number of important things. That report, which was released in January this year, found that Pistorius demonstrated some potentially significant differences in energy use, and biomechanics, and formed the basis of the initial IAAF ban of Pistorius. There is of course a problem with this finding – the measurement of oxygen use during sprinting is a questionable one. That’s because energy comes from aerobic and anaerobic sources, and so one can challenge the conclusion that Pistorius uses less ENERGY. It is highly likely, however, because if the aerobic energy use is down, there’s no reason to believe that the anaerobic might not also be reduced. However, it doesn’t PROVE it, only suggests it very strongly. 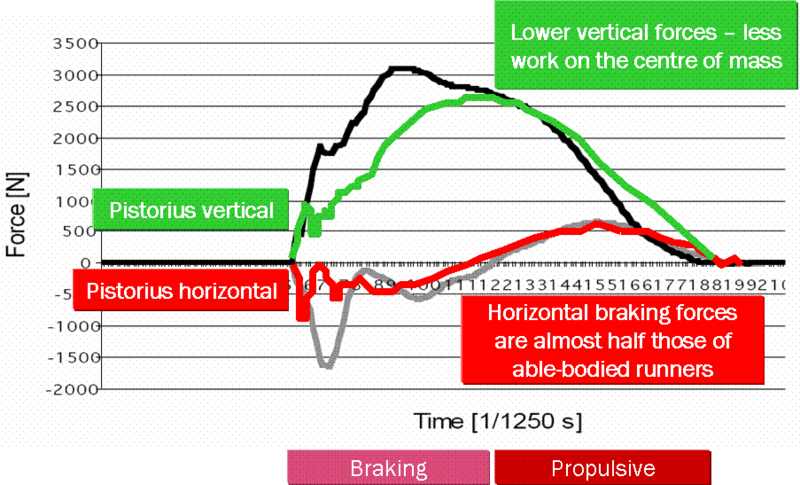 Here, you’re looking at the horizontal and vertical forces on landing, braking, and then moving through into the propulsive phase of the running stride. It was little surprise then, that the IAAF banned Pistorius. You can read much more detail about the tests and the ban here. That would not be the end of it – with the money at stake, that is not surprising. What happened next is that Pistorius went door-to-door, looking for scientists to assist with his defence. I know this because, in one of the bigger ironies of 2008, I was one of those asked. He sent a request to the Ministry of Sport in SA, requesting help. That was sent to me and all other scientists across SA. He received no joy here. That the conclusion drawn was correct. That did not dissuade team-Pistorius, and they continued to knock on doors, until some were opened. Eventually, Prof Hugh Herr of MIT and Prof Peter Weyand stepped in, and research was done that would eventually make its way to the CAS in Switzerland. This would be the moment where I go into a discussion of what that science is, how it was done, and what it showed. But, unfortunately, I can’t. We have not seen it – we have only heard its conclusion, and it has escaped review and analysis. So, what we have here is a situation where the IAAF submitted their research (methods, results, conclusion) in January, giving Pistorius three months to build a case. On the other hand, Pistorius and a team of eight lawyers from New York (funded how, you might ask?) rolled into Lausanne with ‘never-seen-before’ evidence ON THE DAY of the hearing and presented the alternative science. There was no chance for the IAAF scientists to review, rebut and challenge the science. I wrote at the time that as soon as that science was released, that given the chance, I’d be able to find at least half a dozen flaws with it. That was not folly, it was realism of science. The very nature of science is that no research is airtight, no study PROVES anything, especially on something as complex as this. There is little in sports science and physiology that is KNOWN – theories exist, and they are countered by other research that draws different conclusions. The same is true of this case. Sadly, however, the research done by Pistorius has not been published, its methods have not been revealed, and we can only wonder. That’s not to say that we don’t have some insight on the US-testing. That has been “leaked” as a result of interviews, boasts, claims and reports. And it’s actually the Pistorius testing that provides the surest evidence to date that Pistorius has an advantage. At slow, jogging speeds, on a treadmill, Pistorius uses the SAME oxygen as able-bodied runners (not sprinters, mind you, but distance runners). This is one of the findings of the Herr-Weyand research. I hopefully don’t have to unpack how many problems there are with the second finding – first, testing the carbon fibre blades on a treadmill is questionable. Testing them at slow speeds is questionable, and comparing Pistorius to distance runners (who are more efficient) is also very dicey. 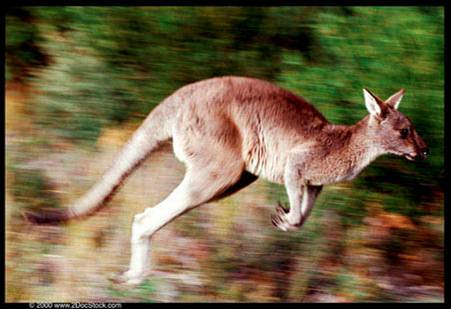 He uses LESS oxygen than able-bodied runners when he is sprinting at 400m speeds. Regardless of which option, Pistorius now has a problem. He has shown, through his OWN research, that he has a physiology that we have NEVER SEEN BEFORE. A human being who does not increase oxygen use as he runs ever faster? There is one other animal that can make this physiological claim. Its picture is below. This is one of perhaps five or six arguments that can be made against Pistorius’ science. 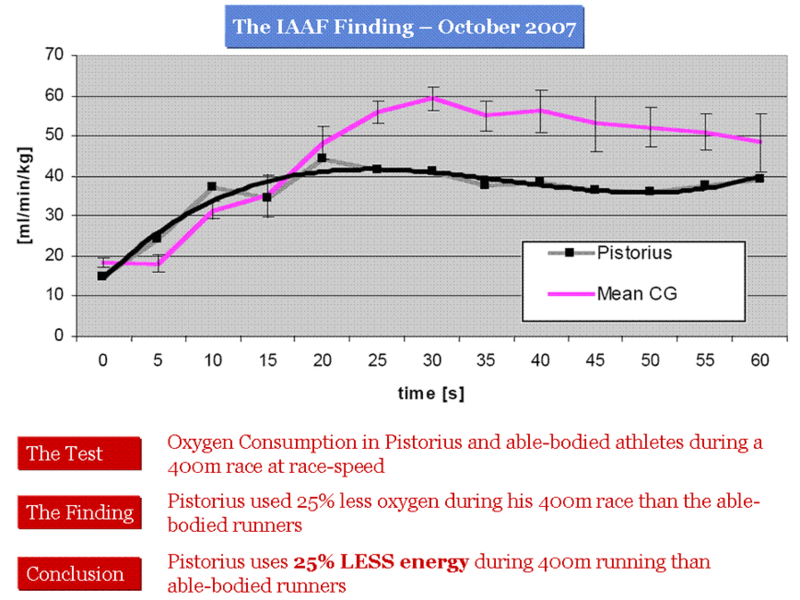 For another one, read this post, in which I explain how Pistorius displays a remarkable anaerobic adaptation to exercise. Then there are the mechanical factors, the reduced braking forces, the differences in ankle moments, the weak arguments by Pistorius’ scientists that the knee joint must take more work. The scientific debate on Pistorius’ science for sale is far from over – 2009 will bring all those discussions. One to go – join us tomorrow for the Top Sports Science story of 2008! This post is part of the following threads: 2008, News/Controversies, Oscar Pistorius, Year-in-Reviews – ongoing stories on this site. View the thread timelines for more context on this post.